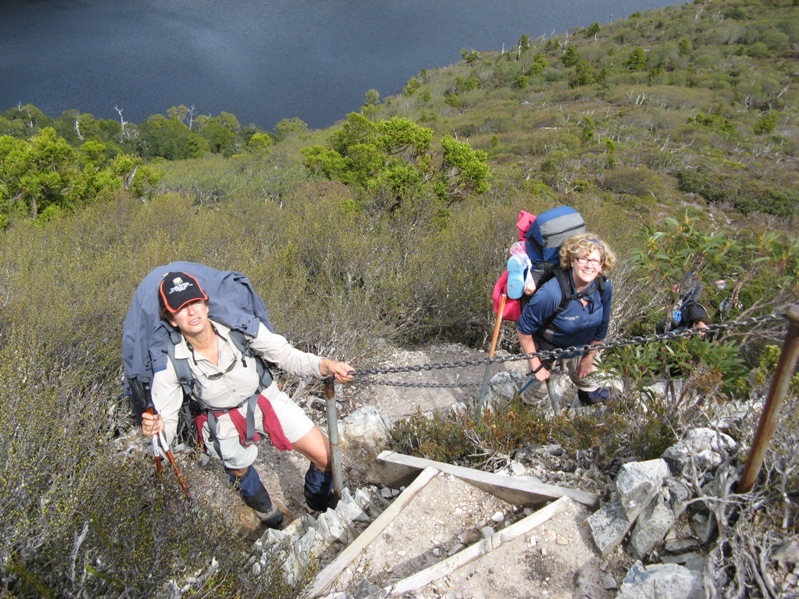 The South Coast Track in Tasmania’s South West National Park can be a challenging bushwalk. 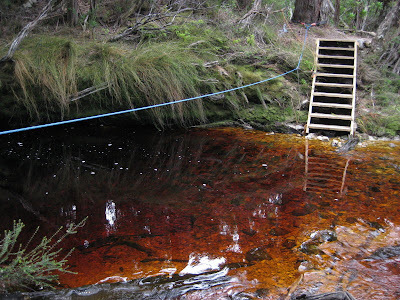 It is generally undertaken over six nights with most people walking from Melaleuca to Cockle Creek, in Tasmania’s South East corner. We did the hike three years ago and struggled with the long days, mud and more mud. We spent so much time trying to work out where to walk we never took the time to take in much of the spectacular scenery. Frank talked Sue (and a couple of mates) in, to do the walk again in February 2009, with the plan to take 8 nights and enjoy shorter hiking days. This time the mates finished the whole walk and we ended up exploring the area before the Ironbound Ranges and around Melaleuca. Sue is writing a blog post that will be posted soon on our adventures – We already have one post up about our experience with the flooded Louisa and Faraway Creek. In this post we have the words and images of Anne Stockley, from San Diego in the USA. She was on the South Coast Track just days after us. We all remember seeing each other at Melaleuca before she set off. Anne, a lean mean hiking machine. Anne has obviously honed her kit really well and carried 11kg, including food, on this trip. 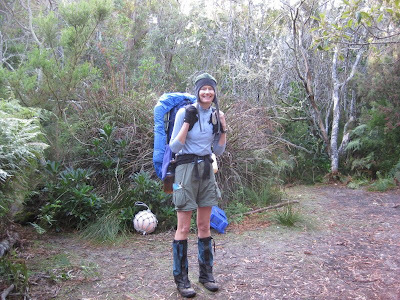 That is a significantly light weight pack and we could all learn a lot from her. 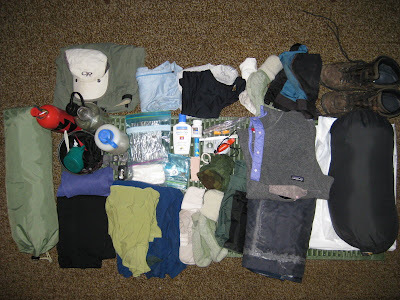 Gear: Tent, Fuel bottle, MSR stove, 2 x 32oz water bottles, mug, titanium pan, spoon, aluminum foil wind shield, aluminum foil pan lid, 2 x lighter, map, compass, whistle, loo roll, suntan lotion, lip goop, ear plugs, blister kit, safety pins, netting headnet, rucksack, rucksack cover, camp towel, anti inflamatories, pain killers, antibiotics, sleeping bag, 2 compactor liners to keep sleeping bag dry, zip locks for all night wear clothing, sleeping mat, sleeping mat compression strap, head torch. 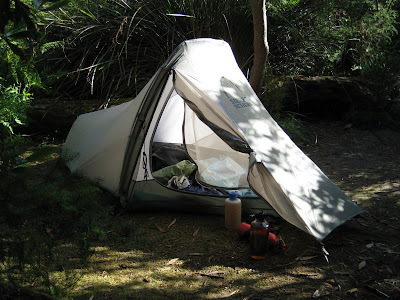 In late February 2009, I did a solo backpack of the South Coast Track in Tasmania in 5 days and 5 nights. Highlights for me included the campsite at Point Eric and the calm seas and sunny afternoon I enjoyed while there, the straightforward New River Lagoon crossing (I had been anxious about being able to drag the boats across the sand), the fact that I didn’t have to swim the South Cape Rivulet as others recently had to, Prion Beach and Prion East which few people rave over, the bird life on the beach, the awesome views on the flight to Melaleuca, and the friendly Hills family group and Eric. After arriving at Melaleuca, I walked to Point Eric in changeable conditions. 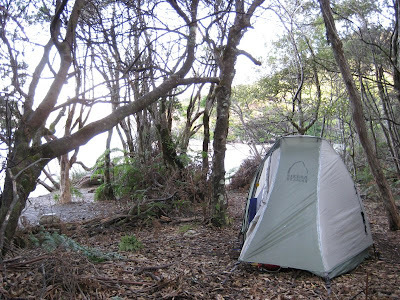 After I had put up the tent the ocean and weather became calm and I was treated to a starlit night. There was lots of interest on the beach including oyster catchers, plover, starfish, interesting seaweed, a red tide, and signs of flash flooding after the storm 4 days prior. I woke up early and was walking east on Cox Bight by 7am. 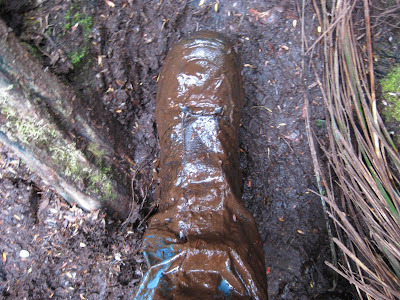 By 8am I had fallen in a watery bog over my knees and my feet weren’t dry for the rest of the day. 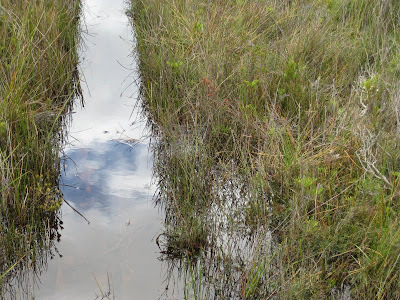 My anxiety about the three river crossings for the day (Faraway Creek, Louisa Creek and Louisa River) was unnecessary as they were all very straight forward below knee crossings. A classic driech day climb over the Ironbounds with no view from the top. Fortunately the wind was only a gentle 15mph or so. 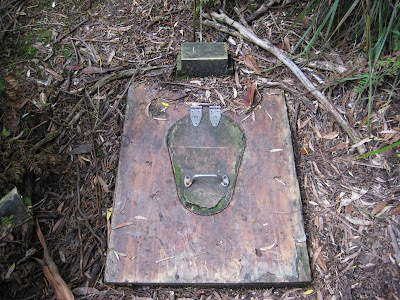 The descent was a sopping wet scramble and lower off branches over slippery roots, showered by every touch of the wet rainforest vegetation. Arriving at Deadman’s beach at 11:30am I realised that I could make the 1:30pm high tide at Prion Boat crossing and so I carried on. I set out from Prion Boat crossing camp after a lie in and with no particular plans as to were I would stop. I ended up spending part of the morning walking with Eric and then continuing on to Granite Beach for a shower. 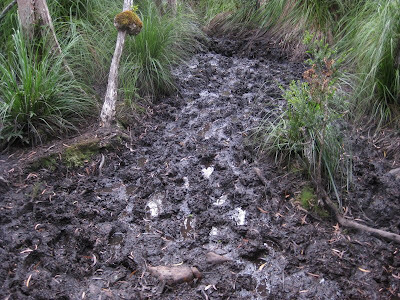 Pictures below are a couple of examples of the muddy conditions on this track…. The weather seemed to be changing with high cirrus clouds coming in from the west the afternoon before, so I got an early start over the South Cape. High tide was about 2pm so I wanted to cross South Cape Rivulet before then. It was raining when I got there and so I carried on to Lion Rock. I was not inspired by the campsite there and walked out to Cockle Creek. Many thanks to Anne for agreeing to have her pictures and words reproduced here. Hi, What tents are you using in the two tent pictures on this post? I’m looking for similar ones and not having much luck. Thanks for your comment. I can’t find what type of tent it was. Hopeful;ly someone will comment here. 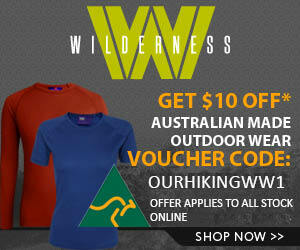 I will also post on Our Hiking Blog Facebook page. Someone there might recognise it. Then again, I see it is a Sierra Designs – would be quite an old model now.